We rode our electric bikes up to our friends' garlic farm for their annual Garlic Festival today. It's a low key event held every August, but educational (there's more to garlic than meets the eye!) and delicious, and we always come away with a year's worth of garlic. However, the highlight for me this year was visiting the basil, growing hydroponically in a greenhouse (... visions of pesto pasta for dinner). There was a lull in the garlic barn, so Dan gave us a tour of the basil operation, explaining how he pumps water from the irrigation pond and then filters it four times or more and finally puts it through a reverse osmosis unit. (He has to do all this because he sells the basil commercially, and grocery stores have very high standards for cleanliness at all steps in the growing process.) All the "waste water," instead of being wasted, is recycled back into the pond. Everything was homemade, using household items and fairly simple technologies, with a little help from a mutual friend who's into electrical engineering. Now, I didn't understand everything that Dan explained (physics ≠ me), but I perked right up when he said his next dream is to power all this using solar panels. This led to a discussion about the importance of using the best of the old ways, and integrating the best of the new technologies. This is what's so exciting, so compelling, about creating a sustainable future. You see, so many people get stuck in "either/or" thinking. Either life stays the way it is (comfortable and unsustainable), or it becomes sustainable and miserable. What a crisis of imagination! 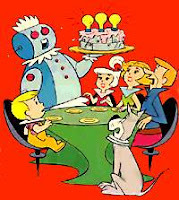 Why can't a generation that grew up watching The Jetsons and Star Trek on TV picture a different world, a different way of living, that works? No, we're not going back to the cave, unless we totally fail to use our collective and individual imaginations and creativity to imagine a wonderfully sustainable new world into being. The Cake is Burning! The Oven's Still On!